I suppose you could use lettuce in place of the leeks if you wanted, but I like the more savory touch the leeks add to this pasta salad. It's a salad that I found tastes better as it sits so the ranch flavor from the dressing really get absorbed by the pasta. You could refrain from adding the bacon until the last minute if you want the crunchy texture but it's certainly up to you. For a gluten free alternative, substitute the pasta with a gluten free variety. Mix together the mayonnaise and dry ranch dressing mix in the bottom of a large bowl, set aside. In a medium skillet over medium high heat, add the oil and saute the chopped leeks. Cook until softened. Add the leeks to the large bowl along with the remaining ingredients. Carefully fold in all the ingredients to incorporate and coat with the ranch dressing. Season with salt and pepper to taste. Cover with plastic wrap and chill for at least an hour before serving to allow time for flavors to meld. What an awesome idea for a summer salad! I love this! 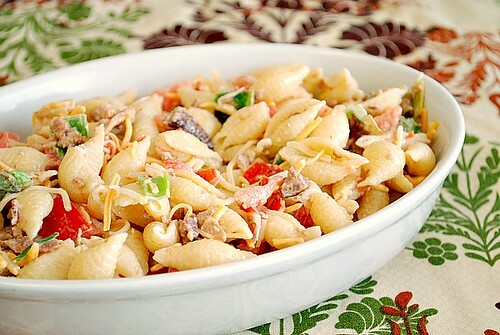 I made the BLT pasta salad for dinner last night. Had to omit the leeks because the family cannot eat onions. It was great!